The Salter 021's are a little difficult to set to zero. If ya have trouble with small knobs you might want to try the 3720 instead. We've tested that one and it is much easier to set to zero before weighing. Plus, it has the same capacity, readability and small size as the 021. 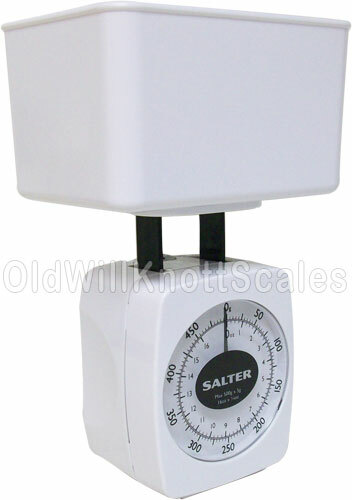 Scale Size 2.86" x 4.5" x 2.5"
The Weighing Container Does Double Duty! With this food scale, you can easily weigh your food portions for meals and recipes and when ya aren't using the scale at all, it fits nicely inside the weighing container for storage. It takes up about as much room as a regular old coffee mug. Dual Reading Dial Doesn't it get on your nerves when one recipe calls for ingredients in grams and the next recipe calls for ingredients in ounces? Well with this kitchen scale, that won't be a problem. The dual reading dial on the Salter 021 displays your weights in both grams and ounces simultaneously...you'll never have to worry about switching back and forth between units again. Basic scale, not a exact measurement, but good enough for my use. You get what you paid for applies. Fast shipping, good packaging, using mine daily. 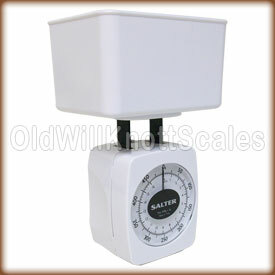 When our old scale broke we went looking for a replacement and found various electronic scales. Then we saw this exact replacement of what we had. Ordered it and it was delivered in a twinkling with the sort of customer service everyone would like but which big companies have forgotten how to deliver. I came to this site looking for a scale so I could cook with metric and this scale does the job well. With just a little calibration, this scale works great! It's much easier to work with than measuring with cups and spoons. 5 stars! The Salter 021 is just as described. It is quite small, just what I wanted. It does not hold much, again just what I wanted. It was packaged well to survive the mail handling. I really like it a lot. It is perfect for one or two people who want to keep their servings reasonable. Thank you. I like the container with its lid that I can put the scale in for travel. This small scale is perfect for our needs. We just started a weight loss plan and this scale is very helpful. The zero was off when it arrived but after adjusting it works perfectly. And to top it off the price was great. Couldn't ask for a better deal. Thank you. I am so happy with this scale. Being from Europe, it's my little helper because it shows me everything in grams! It can be stowed away without headaches because of its small size, but it sure does a big job. Love it. This is a nice little scale, but it was not calibrated right. With the basket, it starts beyond 0 and I need to adjust the weight for the basket each time I use it. It's not a big deal, but I am pretty sure it is supposed to start at 0 because without the basket, it starts at a negative weight. Anyway, it serves my purpose to weigh 150 g of meat for HcG recipes. I am so pleased with this little scale. It is perfect for my needs as I start my diet. So easy to use. This type of scale is hard to find on line. I found it in a local store. This is a great little scale for students to use to explore mass. They are sturdy and everything fits inside the weighting boat so they are easy to store. The price is right for schools as well. This scale is perfect for my needs- small and accurate and closes up neatly into itself. But what I love more is the customer service of this company. Just the right blend of old fashioned caring and quality. And add to that that the price is right! Thank you.